It's time for another episode of Super Fortune Wheel! Click here to play! That's right, folks, another contestant will take a chance spinning the wheel to see if they can spin in their super fortune! Before we get started, let's just go over the rules. You'll need to spin the reels for a chance to bring in plenty of big cash prizes. Though there are a few items to watch out for while you're playing. As anyone might expect, diamonds are a player's best friend. These precious stones act as a substitute. They only appear on selected reels but they'll replace most other symbols to help you create more wins. Next up is the globe. This spherical icon will bring in up to 5000 times your line bet if you can spin two to five of them across an active pay line. And, don't forget the dice! Spinning two to five of these will bring in up to 1000 times your line bet! Of course, you'll want a chance to spin the super wheel to bring in the real prizes! This scatter symbol will multiply your total bet if you can spin two or more anywhere on the board. Three or more will trigger a bonus feature that will see you playing for super cash prizes! So get ready for another episode of Super Fortune Wheel. You might just spin in a super fortune! The Super Fortune Wheel is a scatter. If you can spin two to five of these anywhere on the board you will get up to 200 times your total bet. Spin three or more and you will trigger a bonus feature. The shimmering diamonds act as a wild symbol. They will replace all other symbols (excluding scatters) to create more winning lines. They only appear on reels 2, 3 and 4. 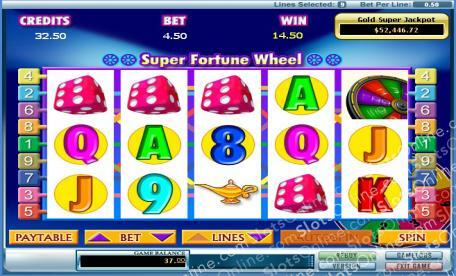 Spin three or more Super Fortune Wheel symbols anywhere on the board and you will trigger a bonus feature. During this game you will have to spin three wheels with numbers ranging from 2 to 100 on them. The numbers the wheels stop on will be multiplied by the triggering bet and added to your account.